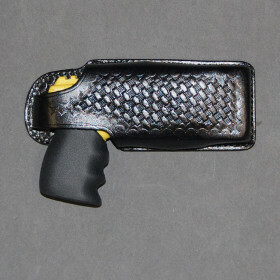 Top quality leather holster custom-made specifically for the PhaZZer Enforcer CEW. Holster has enclosed Trigger Guard. Available as Cross-draw or Straight-draw in Black Basketweave. Made in the USA.